Tao Motion was created by Gabrielle more than 20 years ago. After so many years learning from Mantak Chia and Juan Li, her goal is to share the experience of her own study. Her priority is to embrace our own humanity, to connect with others, inquire and exchange experiences deep from our hearts. All the exercises, ideas, practices and meditations are deeply connected with the natural flow of life, which is always changing. The roots are the DAO (= Tao) which is a living philosophy and at least 2500 years old. Some claim the roots of the Tao are found more than 5000 years ago. For Gabrielle the main message of the Tao is, to open your heart and embrace life with all it's facets. The main practices of Tao Motion are originated by the Universal Tao, Master Mantak Chia or are inspired from her Teacher Juan Li and others. Since 2014 Gabrielle started to present her own exercise creations, which she calls: Tao Motion practice. On this website all the workshops are taught by Gabrielle, unless specified. was born in Germany in 1961 and is now based in New Zealand, Christchurch. 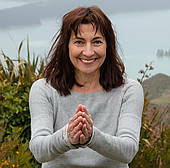 At the age of 16 Gabrielle started learning Hatha Yoga, energy work and spiritual development. These became an important part in her life. From the age of 20 she learnt about internal practices in Tao and Tai Chi Chuan. To teach and live the daoist lifestyle, which she has done for more than 35 years is her life's vocation. In the last 25 years she has been traveling a lot in Europe, Thailand, USA, Australia and New Zealand. Both gaining more knowledge and then passing it on in teaching sessions. She is an International Healing Tao Senior Instructor and is authorized to train Associate Instructors. Gabrielle works closely with the Founder of the Universal Healing Tao System, Master Mantak Chia. Gabrielle's background also includes study in Daoist Dream Yoga, I Ching and Inner Alchemy. 1979 she went to India, Cashmere and Ladakh to learn more about Yoga and meditation. In 1981 she intensified her knowledge about Tai Chi in Germany. In 1983 she got her Yoga Teacher diploma in Cornwall, England. Here she started teaching Yoga and continued in 1985 when she moved back to Germany. More than 20 years ago Gabrielle became interested in Feng Shui, because of its part in the Dao. Later out of a personal interest she started training to be an authorized Feng Shui Consultant and Feng Shui Teacher. Now her main focus is on Body work and Inner Stillness.